Contact for gasoline price predictions, fuels industry knowledge, DTW / zone pricing & more. 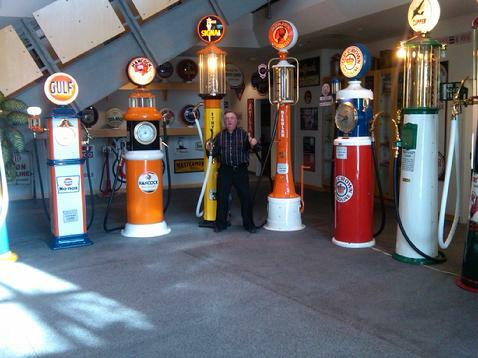 "Bob the Gas Guy holding two antique gasoline pump nozzles shows his willingness to take on all comers and causes in order to right the wrongs in our petroleum industry." The Keystone XL pipeline will go a long way in relieving pressure from the U.S. being forced to continue importing crude oil from the Middle East. Iran will not have the oil hammer over our heads when the pipeline if constructed and in full operation. Even former President Bill Clinton came out in favor of the Keystone XL pipeline to be approved by the State Department and President Barack Obama. The Bakken formation oil shale will be part of the shipping of crude oil to our refineries on the Gulf Coast and could possibly be completed without presidential approval by having its starting point be in Baker, Mont., instead of Hardisty, Canada. Output from the Three Forks/Bakken/Elm Coulee oil fields is already at 200M barrels a day heading for 500M in about five years. The proven reserves are up to 4.2. billion barrels of crude oil. I attended a recent seminar conducted by Sinclair in which they estimated the additional shale oil not yet recovered could be up to 50 billion barrels. They are working on developing even better technologies to make it happen. He stated their break-even price to be at $50 a barrel, which would go a long way to lowering the price of gasoline in the U.S. I filled up at the Costco in Billings at $2.999 per gallon last Friday with the U.S. average price of gasoline at $3.70. Montanans are saving a lot of money on the price of gasoline since the Bakken oil is being discounted to local refiners as much as $27 a barrel off the West Texas Intermediate price. Bob van der Valk has been around fuels a long, long time. He's seen all kinds of them formulated, manufactured, transported, stored, priced, marketed, sold and consumed. Having accumulated a vast store of knowledge on this subject, he's gotten good at providing easy to understand explanations of things thought mysterious by the public at large and even predicting fuel-related trends and events relied upon by folks making their day to day living in the retail fueling business. So it's just sort of natural for a fellow like Bob (with a last name like his) to acquire the Twitter handle as "Bob The Gas Guy" . Bob "The Gas Guy" van der Valk: FrackNation versus Gasland . Is OPEC losing control on world's crude oil prices? Contact Bob not only for his gasoline price predictions but also for his trend analyses, fuels industry knowledge, DTW / zone pricing issues, commercial fueling network, wholesale and retail branded & unbranded matters, refined products margin questions, plus retail fuels issues. To find out more about him , click here on Bob's biosketch . "The Gas Guy" is a 50 year veteran of the wholesale & retail gasoline and lubricants industry within the Los Angeles Basin...which is generally acknowledged to be the largest and most competitive gasoline marketplace in the world.